There are many ways to control an underfloor heating system. First of all, almost any boiler can be used for underfloor heating. The most energy efficient system to use with underfloor heating is a condensing boiler. Note, if the underfloor heating system is going to be used with a combination boiler, always check with the boiler manufacturer that the flow can be fitted with a secondary pump. Our system also works very well with heat pumps. Underfloor heating is self regulating if the building is properly insulated. Heat output is dependent on the temperature difference between the floor surface and the room temperature. For underfloor heating systems, the temperature difference between the floor surface and air temperature is very small; even a slight change in room temperature can significantly alter the temperature difference and the underfloor heating compensates accordingly. A practical example would be a dining room. First the dining room is completely empty and then when dinner is served, there are many people in the room giving out heat. The underfloor heating will automatically reduce the heat output and the warm water will simply heat another part of the building. Beside each manifold a pump and mixing valve is installed. Normally we recommend the S-plan system, i.e. two port valves are installed by the boiler to give each manifold circuit independent control. 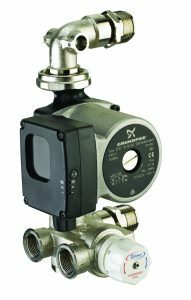 The control pack includes a 6m Grundfos pump and a RWC high flow mixing valve. These components are all necessary for the underfloor heating system to work. In small flats where combi-boilers are used it is possible to control the water temperature with the boiler control. We do recommend a safety device to prevent temperature going over 60°c. At the centre of the underfloor heating system is always a manifold. All the pipework in the building is brought back to a central distribution point, which is called the manifold. The flow and return is taken from the manifold back to the heat source of the building. Return manifolds fitted with two-purpose control/balancing valves. Wide range of accessory options. Both trunk ends with flat-sealed joints (nut and gasket) for safe, quick and easy installation. Supply and return manifold are each fitted with an isolation valve and a purge/vent valve assembly. 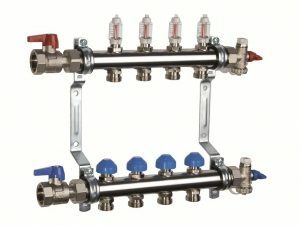 Supply manifold fitted with circuit flow meters for accurate and easy balancing and visual flow indication. Minimised depth dimension allows flush-wall enclosed cabinet mounting. Control valves are designed to accommodate standard actuators. High flow, thermostatic blending valve for underfloor heating applications. These valves are suitable for blending the flow and return to achieve a stable system temperature, in systems up to 200 sqm. The thermostatic wax element ensures stable mixed water temperature with quick reaction to supply temperature changes. Quick reaction to supply temperature changes. User adjustable between 25°C and 60°C. Compression type connections for ease of installation. The Underfloor Heating Systems Ltd manifolds are supplied with thermostatic options. This means basically that actuators can be mounted on the return manifold. The actuators act on an on/off basis and they are connected to an air thermostat in each room. The room thermostats and the actuators are 220-240V. 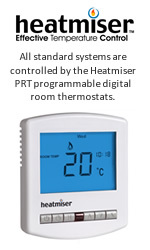 Our room thermostats are programmable Heatmiser PRT thermostats (3 core + earth) with set-back. We can also supply wireless room thermostat and Heatmiser Neo Smart thermostats that are either hardwired or wireless. The Neo thermostats will work with any Smart mobile. We do not recommend individual controls in the bathrooms as they often require hot water to circulate through the loops to dry the floor. Bathrooms are normally controlled together with the Hall/Landing room thermostat and En-Suites are normally controlled by the bedroom room thermostat. Bathrooms, WCs and En-Suites are usually the warmest rooms in a building. The underfloor heating system does not cover a lot of floor area in a bathroom, so the system might not provide enough heat. Therefore it is highly advisable to install a towel rail or a radiator in the bathrooms, to provide extra heat. This can either be connected to your underfloor heating system, hot water system or it can be an electric towel rail.